Sorry, but this program is full. Keep an eye out for future FODC events! 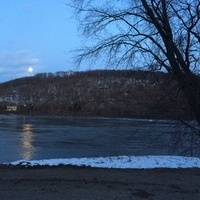 The sight of a full moon rising above the Delaware River in New Hope can be alluring. On February 19, the moon’s magic will be especially strong as its orbit comes within its closest distance to Earth – a mere 221,681 miles away. This “supermoon” will be the closest and largest of the full moons in 2019. Join us as we venture along the towpath at twilight to see the supermoon rise above the hills of New Jersey and the Delaware River. State Park Educator Katie Martens and Susan Taylor will lead a moderately-paced (the colder it is, the faster we go), four-mile roundtrip hike. On the way north from Bowman’s Hill to Lock 11 in New Hope, we’ll listen for owls and keep our eyes open for other nocturnal critters. At Well’s Falls, we’ll take in the grandeur of the Delaware River and watch the supermoon emerge. As we continue northward, we’ll see Locks 8, 9, 10 and the canal outlet to the River. Waiting at Lock 11 and the Locktender’s House will be hot cider, snacks, and a place to warm up before heading back to our starting point. There is no charge for the Supermoon Towpath Trek, but contributions are very much appreciated. It will be held weather permitting. It will be cancelled in the event of rain, total cloud cover, or hazardous driving conditions. Check for a Go/No Go message that will be posted by noon on February 19 on www.fodc.org. Please dress warmly in non-cotton layers, wear sturdy shoes, and bring a flashlight or headlamp, just in case.